Good Morning & Happy Thursday!! The week is almost over & I can feel the excitement in my house! Weekends are always nice and I'm thrilled that my kiddos still enjoy spending time with me!! My creation for today features the Color Throwdown Challenge to use Chocolate Chip, So Saffron & Tangerine Tango﻿/Pretty in Pink. I completely forgot about the Pretty in Pink part but these colors are very pretty together....reminds me of fall! I decided to use the sketch challenge from Splitcoaststampers to help tie everything together.....once again I added texture & used Champagne Shimmer Mist on the whisper white piece but you can't see it in this picture! I'll have to try a different angle or something! Oh well, I do hope you enjoy my card just the same & don't forget to visit me again on Saturday for the next Etsy Challenge!!!! wow jackie! this is gorgeous! i love that stamp in the corner. just finishes the whole card. absolutely gorgeous!!!! I love coming to your blog to see what great card you made and this one is gorgeous, love the 4 squares and the touch in the corner, just a stunning card. 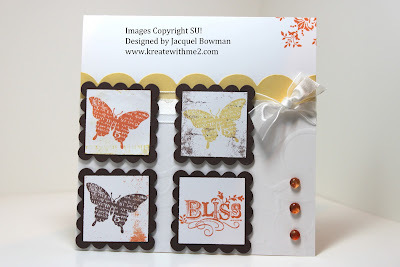 what a beautiful showcase of this stamp set...Bliss is one of my favorites!! Awesome take on this challenge!! Ooohhh, I LOVE this! The white background makes it so elegant. Another fabulous design too. Love how you used this stamp set! So elegant and pretty!! Ohhh...this is gorgeous, I just love the layout and the color combo. Great design! Love the blocks each with a pop of color! Thanks for playing the Color Throwdown! I really like the tile look! You should enter is over at Party Time Tuesday's challenge - it is an anything goes!! A truly elegant card! Beautiful work - TFS! Just became a follower and would love if you follow me too. This is such a beautiful card.. Love this LO .. Very eye catching :)TFS!! Absolutely lovely! I think yours is my favorite card usig Bliss so far. 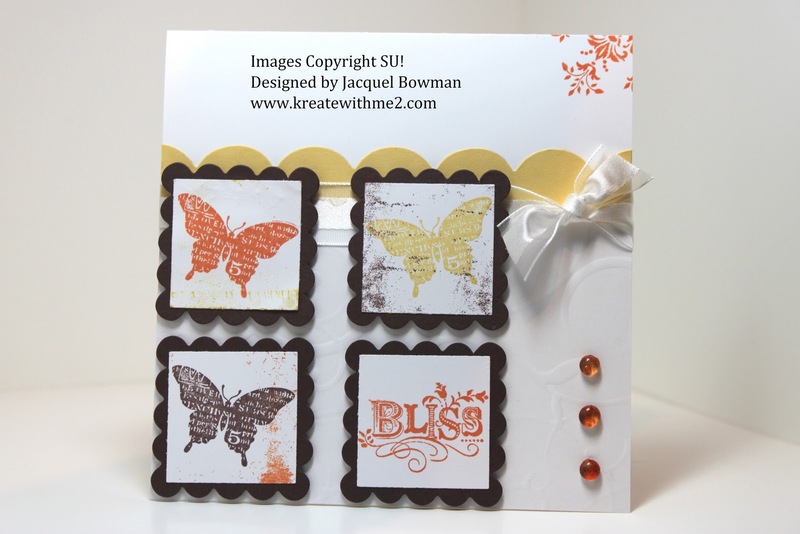 This is beautiful, Jackie...I love how you used the butterfly stamps and what a great layout!!!! Oh, WOW! That is so pretty! LOVE what you did with these colors, Jackie! Thanks for joining us for the Color Throwdown!